In July, I was fortunate enough to attend the third Indonesia Network Operators Group conference, IDNOG 3, which was held in Jakarta. IDNOG is a vibrant community and their conferences offer a great opportunity to learn about the latest best practices and projects in the region as well as connect with new people from all kinds of backgrounds. I was there as a representative of RIPE Atlas, the RIPE NCC’s global Internet measurement platform. I’m originally from Indonesia, and my personal dream when I started working with the RIPE Atlas team was to deploy RIPE Atlas probes in every province in Indonesia. That shouldn’t be difficult, I thought – but I was proven wrong. Getting probes deployed in Indonesia without having a local contact has been nearly impossible. Fortunately, with the help of communities like IDNOG, and thanks to our recent collaboration with APNIC, it’s now much easier to find local volunteers who are willing to host a probe, in addition to generally staying in touch with the Internet community in Indonesia. Although not many attendees at the event had heard about RIPE Atlas, they were engaged and wanted to know more about the project. It was also great to have the support of the conference organizers who helped connect me with 16 people interested in hosting a probe as well as potential hosts who were interested in hosting a RIPE Atlas anchor. Anchors act as enhanced probes that provide large amounts of regional measurement data and are generally hosted in data centres. Learn more about how people are using RIPE Atlas. Just like many communities who learn about RIPE Atlas for the first time, attendees at IDNOG 3 had some concerns about security when they approached me. I made it clear that the probes don’t listen to the hosts’ local, private traffic – they only talk to the RIPE NCC’s central RIPE Atlas infrastructure and perform measurements towards the public Internet. Hosts can also put their probe behind a firewall, as long as that firewall does not prevent the probe from talking to the outside world. So what are you waiting for? Apply for a probe today! As of publication, there are 42 active probes in Indonesia. We saw a spike in the number of probes in August 2015, thanks to a local RIPE Atlas ambassador who helped distribute probes, and the growth continued when APNIC 40 took place in Jakarta the next month. However, the total number of connected probes hasn’t grown since these events. With more than 130 routed ASNs and 50,000,000 Internet users in the country, there’s a lot of potential to grow the network locally. 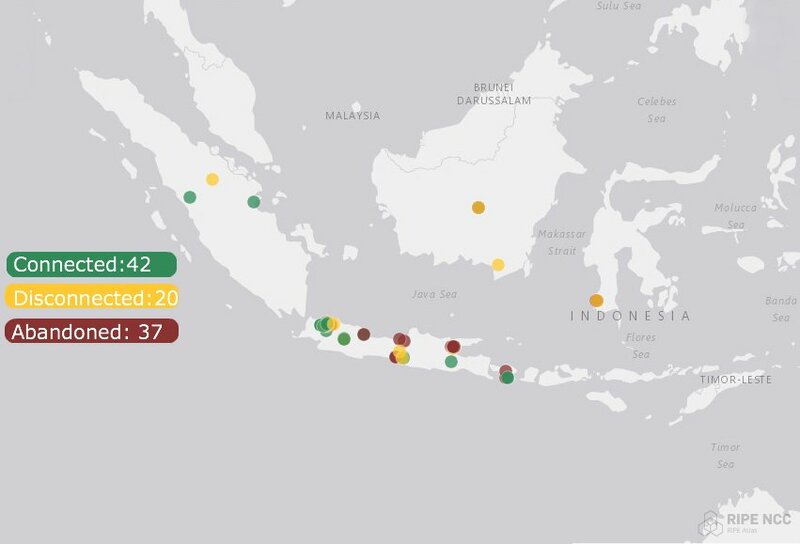 Because RIPE Atlas data is available to everyone, the entire Indonesian Internet community would benefit from having more data available about the health of the Internet in this part of the world. Given this, I’d like to extend my message at IDNOG 3 to every network operator in Indonesia and encourage them to host a RIPE Atlas probe in their AS. Lia Hestina coordinates the RIPE Atlas ambassador program and is the first contact for RIPE Atlas sponsors. 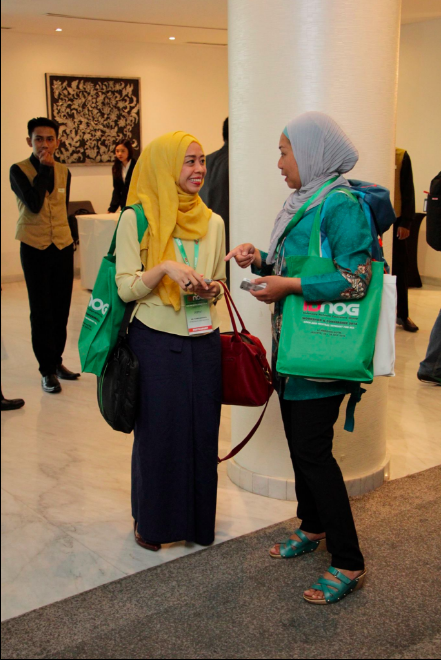 Hi Lia, thanks for sharing about IDNOG, in your first blog. I hope that the project will be succesful, with more probes and useful data from Indonesia. Thanks Lia for sharing your knowledge and experiences. Good luck with your job in The Netherlands and abroad!